And Another One’s Gone, Another One’s Gone, Another One Bites The Dust. Yep, just like that, 2014 has bit the dust and 2015 is mere hours away (as I write). Hope you had a wonderful, safe and enjoyable Christmas and a car trouble free one. Regrettably, the car I was driving, one that is heavily spruiked on tv, had systemic electrical issues, precluding the intended usage and definitely taking the fun part out of a three day sojourn to the south coast region of NSW. As expected, there was a police presence on the roads but not nearly as big as expected; when I say roads, these are the main roads between Sydney to Canberra to Cooma to beyond. As expected, there were numerous acts of low driving standards which contribute to the reasons why our roads aren’t as safe as they should be. From my driver’s seat, they’re habits which infer a laziness in driving and therefore, a lack of consideration for the driver committing them and for anyone else on the road. Since December 1 of 2014, it’s fair to say that summer really hasn’t hit the coastal areas of NSW, with substantial cloud cover, the ensuing low light levels and rain. 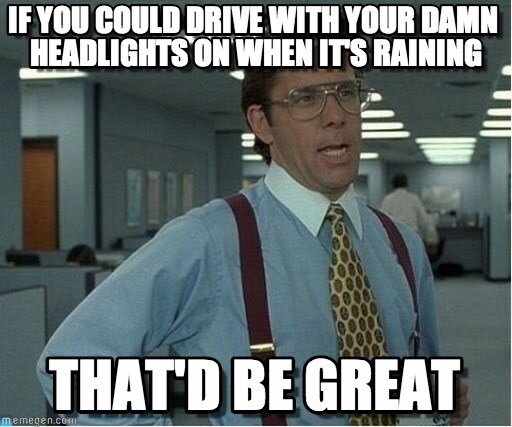 It’s fair to say that drivers either aren’t taught or, probably more correctly, don’t think, to use headlights. Or, perhaps, they drive wearing a blue suit and red cape…Cars have a little lever that’s attached to the steering column and, when moved, make a ticky tocky noise and magically make lights at each corner of the car flash. 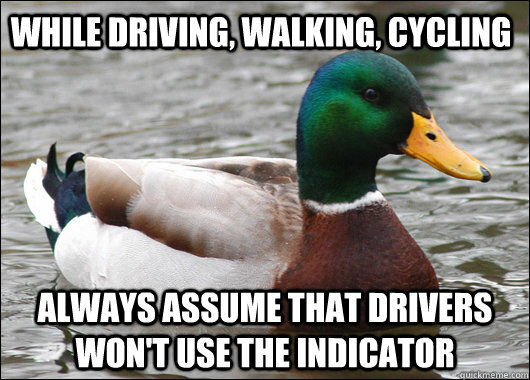 It’s truly surprising how many drivers don’t know about that lever. It’s also surprising just how many drivers will suddenly realise that there is a car in front of them, almost as if they were asleep at the wheel, then violently move into the lane you’re in and just with a metre of clearance ahead of you THEN suddenly brake….with nothing in front of them. 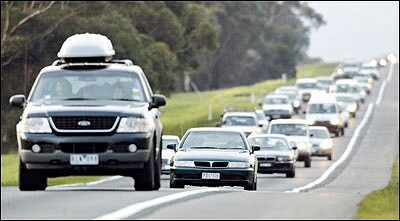 It’s Australia’s most common crash, the rear ender and, sadly, due to drivers that simply don’t care about you. For 2015, here’s what I’d like to see. A return to the basics of driving. Use some courtesy and indicate and indicate with plenty of time up your sleeve, especially at roundabouts. Read the road ahead and look for the slower traffic. Use headlights when it’s dark, ESPECIALLY IF YOU DRIVE A DARK OR SILVER COLOURED CAR. If you’re out on a country drive, once outside the capital or large city metro area, headlights can be seen from quite a distance during the day. Traffic lights are a different matter. There’s too many that seem to be calibrated for the non main stream traffic, where the major road gets but a few brief seconds of green and the intersecting roads a lot longer. When it’s a “normal” intersection governed by lights, there’s more than enough time to slow and stop when the amber light comes on. All too often I see drivers go through, only to be caught by the red at the next set of lights, with those that do the right thing pulling up behind them just seconds later. Bottom line is this; driving to the basics will contribute to a safer road environment and hopefully make a difference to our road toll. As one philosopher said, a drop of water on its own does little but together they form an ocean. Work together to be a better ocean of drivers so our 2015 can be more enjoyable and safe. 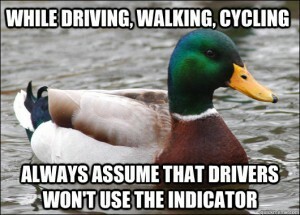 For ALL drivers on the road. Getting from there to here…these were the opening words to the only song ever used on a Star Trek tv series, the largely unlamented Enterprise. They are, however, valid, for both the time of year and this blog. We’re getting close to the 600 articles published by our contributors; Megan, Lewis, David Lye, myself and others before us. It’s a pleasure to be part of the team and we hope you enjoy our musings, thoughts, brain rumbles and reviews. Christmas time in Australia lies in the southern hemisphere’s summer, whilst in the north, it’s winter. Both times of year have their own weather challenges; in the UK, USA and northern Asian and European regions, there’s that funny white stuff called snow. Down here, in Australia, South Africa and America, New Zealand and various island states, summer comes with heat, torrential thunderstorms and something in between. It’s holiday time and the general process is to take the car, pack it with family and go for a drive. Sadly, some simple things are overlooked and we see the tragic results on the nightly news. What can YOU do to potentially avoid being a statistic? 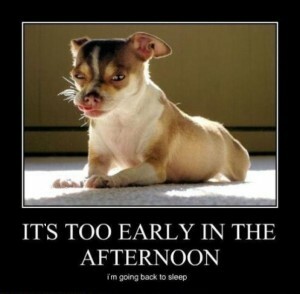 Step one: stay to a routine; if you’re an early riser naturally, you’re half way there. If you’re not, try to stay to your naturally awake time; artificially adjusting your waking zone has been shown to affect driving habits. Stay hydrated; take water with you and take a few sips every half hour or so. Coffee and tea are fine, however you’ll need to bear in mind the natural diuretic effects of them. If you’re driving alone, take a break every 90 minutes to two hours; get out, walk around, stretch, look at something in the distance to give the eyes a different focusing point, rather than on the car in front. In the age before cars became computers on wheels, we’d check oil, radiator fluids….nowadays they’re generally sealed systems so we can look at the windscreen; make sure that’s clean as dirty and grime refract light and can be distracting. Tyre pressures should always be checked and tyre tread depths are worth a look also. When out on the road, keep an eye out for the road conditions and, importantly, the driving styles of those around you. Look at what’s happening ahead of you; if there’s a flow of brake lights then you’ll be forearmed to prepare to brake. If you’re a naturally slower driver or will be towing a load, be courteous and stay in the left lane. If you need to overtake, judge where you can do it safely; don’t do it on a blind crest or a curve where you can’t see what’s coming. Drive to the conditions; it might say 110 km/h but if it’s hammering down with rain or it’s foggy, drive smart and slow down. Use driving lights and, especially if you own a dark painted car, headlights. On behalf of Private Fleet, the team of staff that are always here to help you buy your new car and our contributors, have a safe journey and a wonderful Christmas. Christmas time is fast approaching; a time for family, a time for giving, a time for happiness. As we delve into the devilishly delicious dinner laid down before us, everything in the world feels perfect. But what about those who do not enjoy the same luxuries? As we enjoy the familiar warmth of Christmas time, let us not forget those that must face the bitter chill of winter. There are those who must suffer at the hands of their masters. Their suffering is not just for Christmas. Their suffering cannot be ignored. Let them not suffer in silence forever; it is time to give our cars the voice they deserve. How can we let this suffering continue? Just the other day, my friend sent me this very photo that sits sadly above these words. There are places that are safe for the cars of this world, but it would appear that Croydon (SW London) is not one of those places. 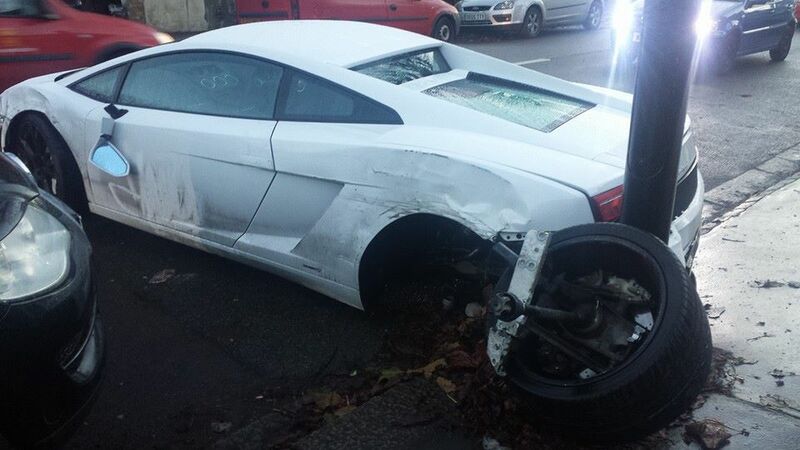 The once majestic Lambourghini, adorned in angelic white has been horrifically besmirched. Her great and powerful legs cruelly ripped away from her body. The sightings of such beautiful creatures are rare in this part of the world, and yet here you look upon the lifeless shell that once roamed so free with so many horses. This was never going to end well.. The pain and suffering caused to the ever endangered Lamborghini species will forever be caused by the oppressive and destructive nature of the human race. In this case however it seems more down to some horrible disease most commonly known as stupidity. 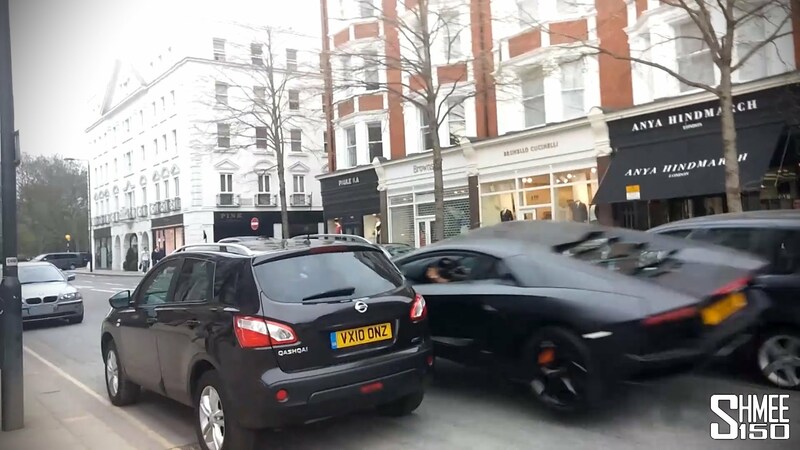 The blame can go one of two ways in this case; either the driver of the Lamborghini was travelling way too fast down an urban street or the car pulling out did not check properly that the road was clear before setting off. This next video really does make me fear for my own safety on the road. Jeremy Clarkson once presented the statement that some people may have started to mate with vegetables. Well, after watching this next clip you may well start to believe it. Brake checking someone is dangerous enough on a small town road, let alone on a dual carriageway where high speeds cause fatal incidents. This total arsewipe decided it would be utterly hilarious to come to a complete stop on the road, just to piss off the driver behind. What happens next, horrifying. The worst part is, that poor blue Peugeot will probably never again feel the freedom of the open road. Let us not also forget both other vehicles involved. The lives of 3 machines forever ruined. Winter is a dangerous time for the automobiles we cherish. Their owners suddenly begin to believe that they have become Colin McRae and that any road surface and any weather condition is no match for their superior driving skillz. And yes, the z is intentional. Of course it is possible to drive in treacherous conditions such as snow, ice and decreased visibility. The problem is that one wrong move will not only cost you your dignity, but also your insurance bonus and maybe even your life. And think of the cars, all they are trying to do is serve their owners and do the best job they can. 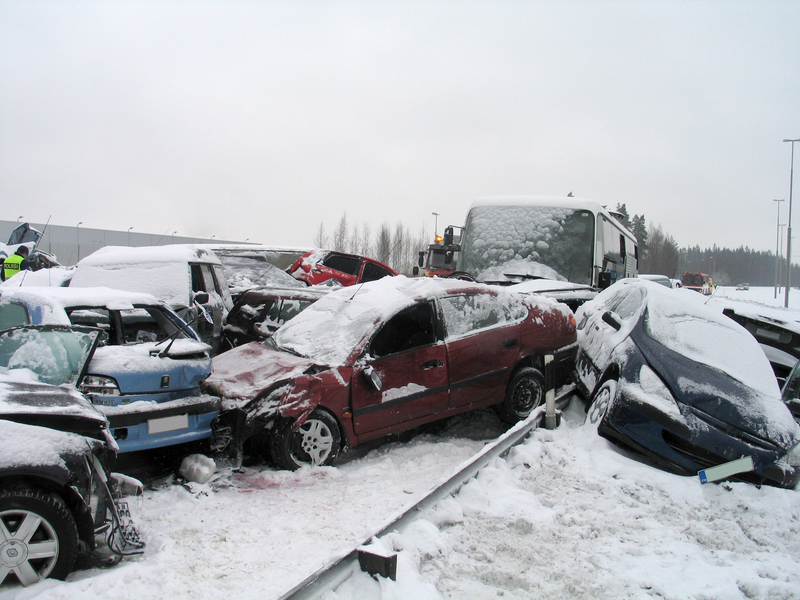 So please, if you can this Christmas, spare a thought for our faithful cars. No presents for the hard working. No warmth embrace of the relatives by the fire. Without them, what would you do? They need our love, they need our care. But please remember, do not take them for granted. Let’s fight the oppression of the idiot, of the LAD trying to show off and the downright brainless. Have a good Christmas everyone, and please drive safe! 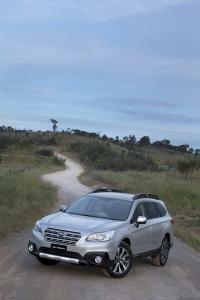 Subaru Price Realignment and New Models for 2015. 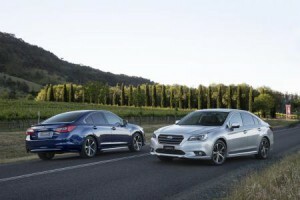 Subaru Australia has announced a significant price realignment of two new generation model ranges, offering savings of up to 25 per cent – or $14,000 – despite specification increases. The All-Wheel Drive Liberty and Outback models offer a wide array of new equipment, including the internationally-acclaimed EyeSight® driver assist system in every Liberty. The multi award-winning vehicles all share an independent five-star rating for occupant safety from the respected Australasian New Car Assessment Program (ANCAP) and have achieved the highest points tally yet by Subaru models: 35.99 out of a maximum possible 37. 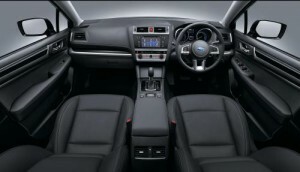 Subaru Australia Managing Director, Nick Senior, said several factors had prompted the shift: “Most notably the exchange rate, the Japanese Free Trade Agreement and more efficient manufacturing, driving reduced costs. “Currency is always going to have the biggest impact on imported goods. It is clear that the Yen Australian dollar equation has moved into a more favourable range for us. We have factored in the Free Trade Agreement, because we know it will be legislated in the near future. Therefore, it is prudent to act now. Also, the Europeans have moved into more mainstream segments and we too have changed strategy with Liberty in particular – making the price versus specification ratio more attractive than ever before. Turning Plastic Back Into Oil? International experts in the area of renewable technology believe that when a society reaches a certain level of affluence, they start to demand better and more technologies that are sustainable and/or renewable. We’ve seen this over the years in the automotive industry. About ten years ago, hardly any car companies had hybrid vehicle and all the really upmarket vehicles were all about power and big gas-guzzling engines. Today, however, nearly every manufacturer has at least one hybrid in the lineup – and these hybrids aren’t snail-paced little dinkies. To take one example, Audi has added the e-tron plug-in hybrid to its already popular luxury A3 line. This hybrid certainly isn’t a slug! Cars that use little or no fuel (if the electricity was generated using a renewable source like hydro) are one part of the sustainable motoring equation. Finding alternative sources of fuel that don’t rely on crude oil that (a) is going to run out eventually and (b) comes from politically volatile nations is the other. We’ve discussed a few of these in the past – algae biodiesel, ethanol, jatropha and the like – and we’ve now found another great development. The stuff we put in our cars so they chug along from A to B isn’t the only thing that comes from crude oil. The other major use is plastic. Now, plastic was developed at about the same time as the internal combustion engine (Bakelite was invented in the 1850s) and really took off in about the 1950s. And we all know how it’s taken over since then and we’re forever tripping over the ruddy stuff on the beach, etc. etc. I could easily go off into a rant about plastic shopping bags and how we need to go back to paper bags instead but I’d better stay on topic. Plastic is made from oil. Theoretically, then, it should be possible to “unrefine” it and turn it back into oil. This is exactly what one Japanese inventor has managed to do. Akinori Ito, founder of a company called Blest, has come up with a machine that will do exactly that. This machine isn’t some massive monster of a factory plant, either. It’s small enough to fit into the average garage and can convert polystyrene, polyethylene and polypropylene back into crude gas. This gas can’t be poured straight into your vehicle’s fuel tank (although it can be used in some generators), as it needs further refining before it’s OK for that. It’s pretty efficient, too. It can take 1 kg of plastic and turn it into about 1 litre of crude. The machine is powered by electricity and the process of turning the kilo of plastic into the litre of crude takes 1 kW/h of electricity. It does produce some residue that is, according to (a) the manufacturers and (b) Japanese regulations, burnable. The process also produces a few greenhouse gases (methane, ethane, propane and butane) but the latest refinements contain a gas filter that breaks these gases down into CO2 and water. The real beauty about this machine is that although it doesn’t convert all plastics to oil, it does deal with some of the most common ones – the sort of thing that most of us have sitting in our rubbish or recycling bins. Here’s a little exercise that you can try once you’ve finished reading this: Go to your rubbish bin and/or recycling crate and pick out the polypropylene, the polyethylene and the polystyrene. Weigh it. Every kilo adds up to a litre of fuel. Polystyrene: disposable cups and other tableware, those trays from supermarket-packed meat, CD cases, packaging, disposable razors, anything stamped with the recycling number 6. Polyethylene: plastic shopping bags, plastic toys, clingfilm, bubble wrap, buckets, lids, pipes, lids, some bottles, anything stamped with PE inside the recycling triangle symbol. Polypropylene: thermal clothing, ropes, carpets, packaging of some sorts, lids, drinking straws, disposable nappies, feminine hygiene products, anything stamped with recycling number 5. Feeling like you’re sitting on a potential oil well? Starting to wonder why we’re just burying this stuff in the ground if we can make petrol out of it? You won’t be the only one! At the moment, the machines are a little on the expensive side, costing US$12,700 at the moment. Blest mostly produces the larger machines, but I’m sure it would be possible for communities or local councils to get hold of these and collect material from householders and businesses and start some drop-off-your-plastic-and-get-cheaper-petrol scheme up. Or some company could look into and find a way to turn office waste into fuel for the company fleet. Alternatively, take a look at the Blest website. I don’t know about you, but I’d certainly like one of these for Christmas! When we look back into the tyre marked pages of history, we often find ourselves remembering the extreme achievements; the best drivers, the worst drivers or even the ‘best’ crashes. It is very easy to say that the greatest driver in a championship in a certain year is the one that wins the title outright. But for this motorsport writer, history is written not only with the grand events and big names, but the individual moments that illuminate the darkness of history. Sometimes to brilliance comes from the midfield. For me, I wish to remember the memorable; the moments that truly prove the greatness of the British Touring Car Championship. This is a personal list compiled for you wonderful readers. 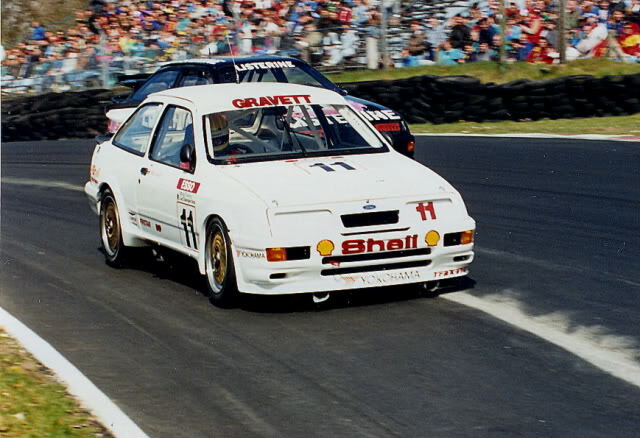 When I think of the BTCC, these are the memorable drives that come to mind. Some of these may be obvious, some of these may be shocking, but they are all moments that define a legendary championship. In no way is this exhaustive; I would love to hear what your would make up your memorable drives in the series! 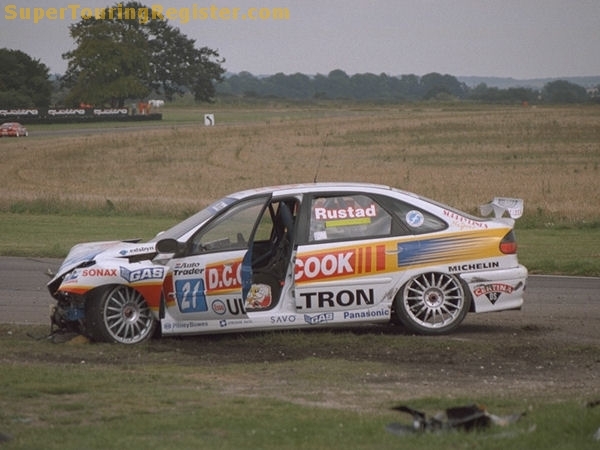 My opening entry comes from a driver who many forget ever competed in the BTCC; Andy Priaulx is most known for his highly successful ETCC/WTCC career in which he won multiple titles. 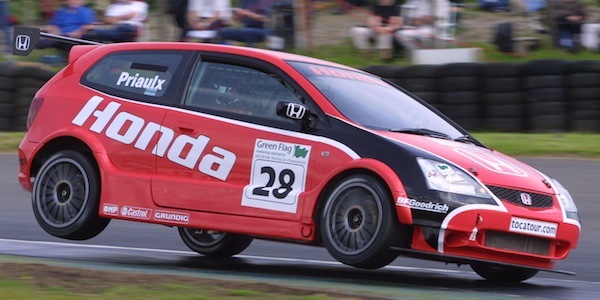 However, before he made his move to the European and World stage, he thought he would throw himself in at the deep end and enter the BTCC with the then returning Honda Racing team in the Civic Type-R. This was the first time Honda had entered the British championship since the departure from the Super Touring regulations in 2000. 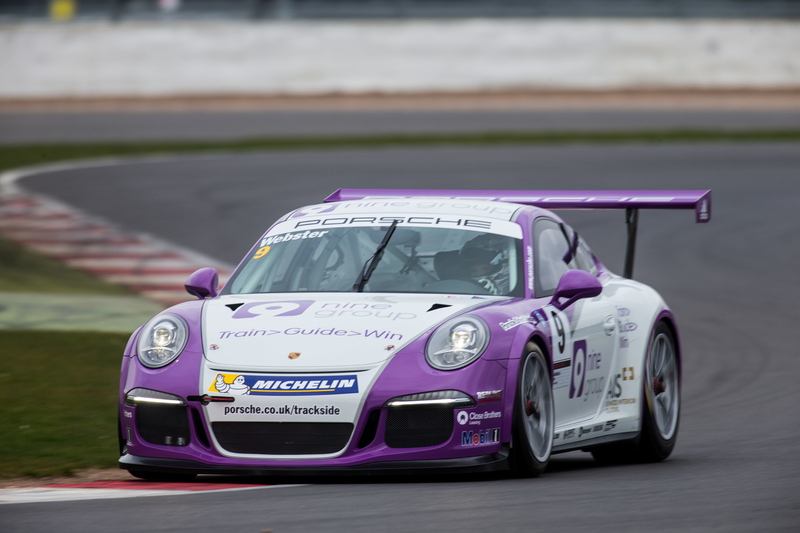 Developments throughout the year surged Priaulx up to the back bumpers of the all conquering Vaxuhall team. 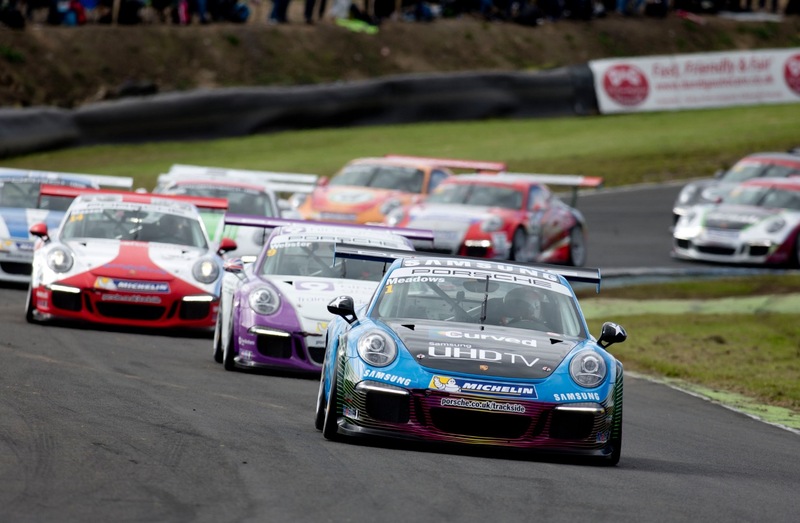 His crowning moment came at Knockhill in ever-stormy conditions he battled the elements to gain his first race win (almost throwing it off in the process). 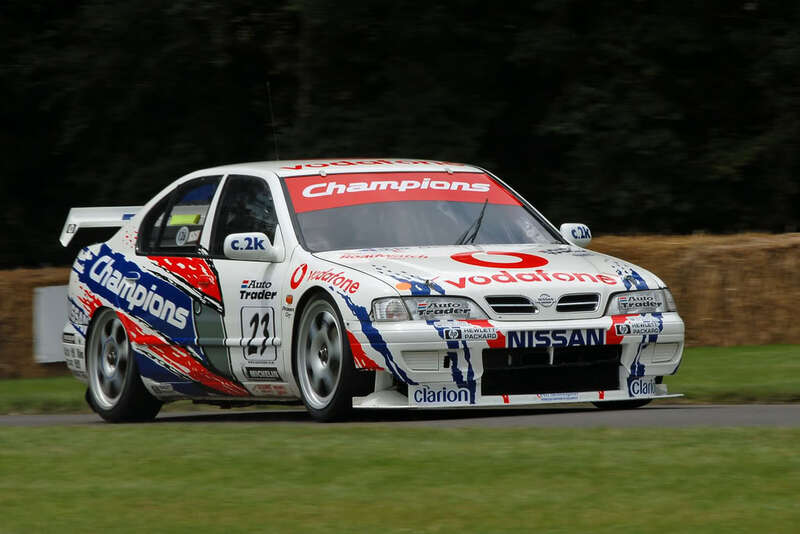 He may not have been a championship contender in 2002, but Andy Priaulx showed true racing talent in challenging the established front runners in what was only his first year in the BTCC (in a brand new car don’t forget). Never give up. Never give in. Never quit. If ever there was a driver who deserved a Hollywood epic (or maybe indie British film) made about his life, it would have to be John Batchelor. 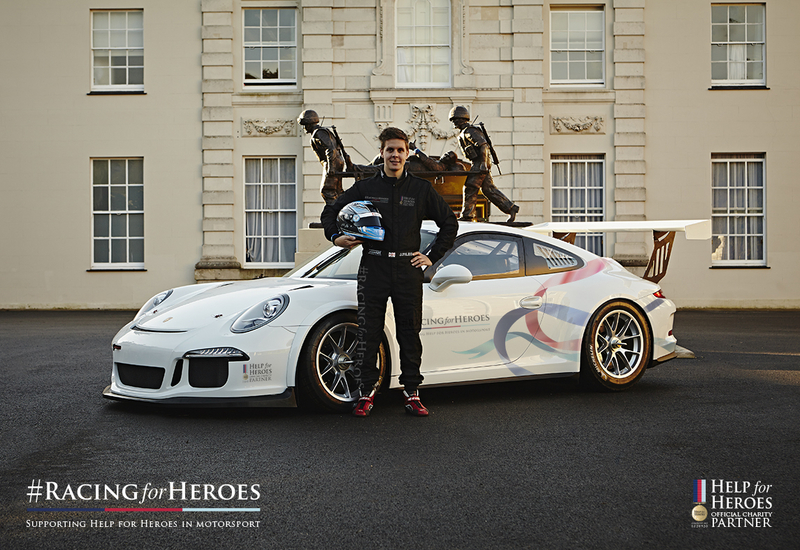 John was a racing driver, businessman, political activist and football club owner (York City FC). This was a man who was so desperate to compete in the BTCC, that he even changed his name to John B&Q so as to secure funding from, yes you guessed it. He competed in 2001 in the production class of the series, never gaining any significant success. In fact, he spent most time getting involved in incidents or having mechanical issue. But as a driver, you could just tell he was happy to be there. The saddest part of the story, he died in 2010 as a result of liver disease brought on by alcoholism. 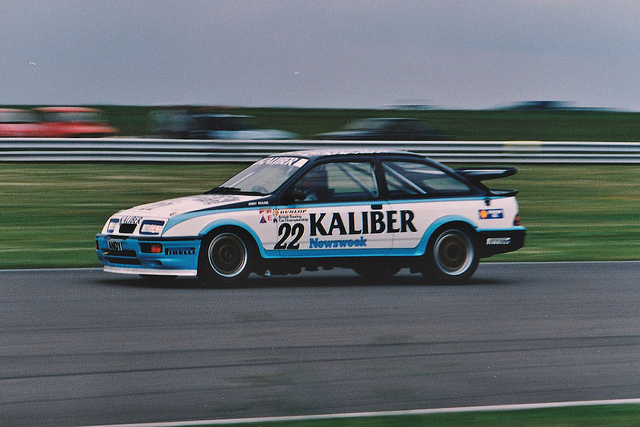 He may not have gotten any trophies or championship success, but the name of John B&Q will go down in BTCC history. 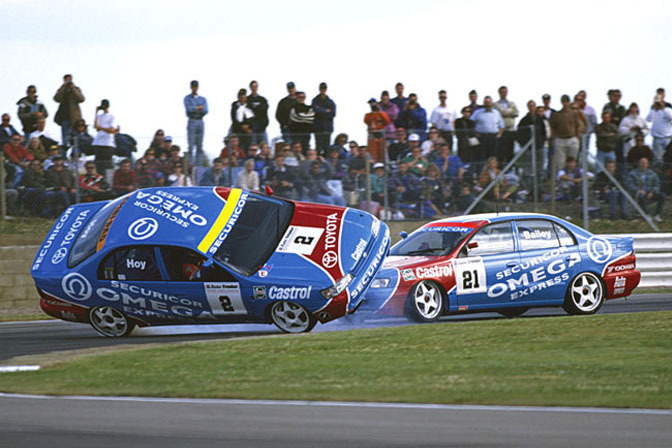 When it comes to memorable drives, there are few that can rival the season long performance of Alain Menu in 1997. For 3 years in a row, Menu had finished 2nd in the drivers standings. So as 1997 came along, Menu and his Williams Renault team decided that enough was enough. Not only did he win the ’97 championship, but he had the championship sewn up nearly half way through the season. 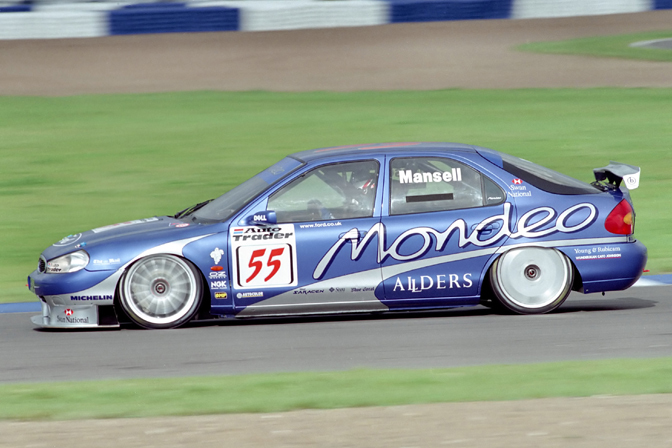 It was a totally dominant drive from one of the greatest touring car drivers that there has ever been. Tommy Rustad 1998 – How did he do that?! 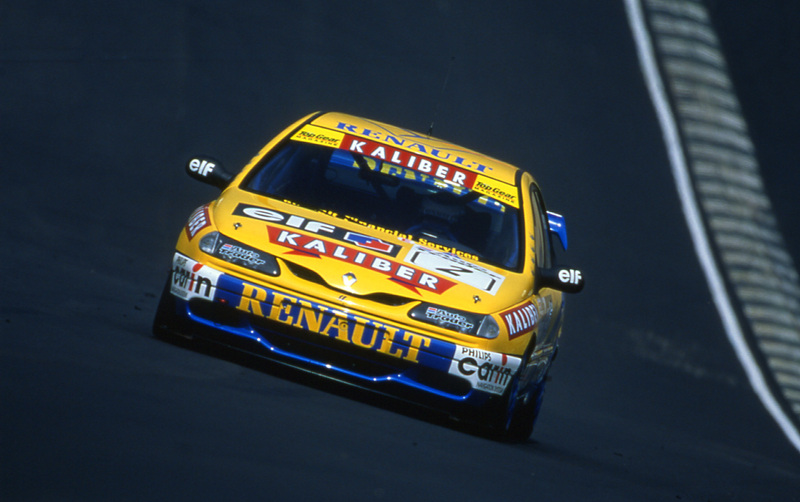 Tommy Rustad competed in the BTCC in 1998 as an independent, entering an ex-factory Renault Laguna. If ever you watch back the review of the 1998 season, you would very often see Rustad’s car involved in some form of incident that would lead him to retire from the race. In fact, the picture you see above is how most people got to know his car in the ’98 season. And yet, somehow, as if by some dark spell from an ancient sorcerer, he managed to win the Independents Championship. 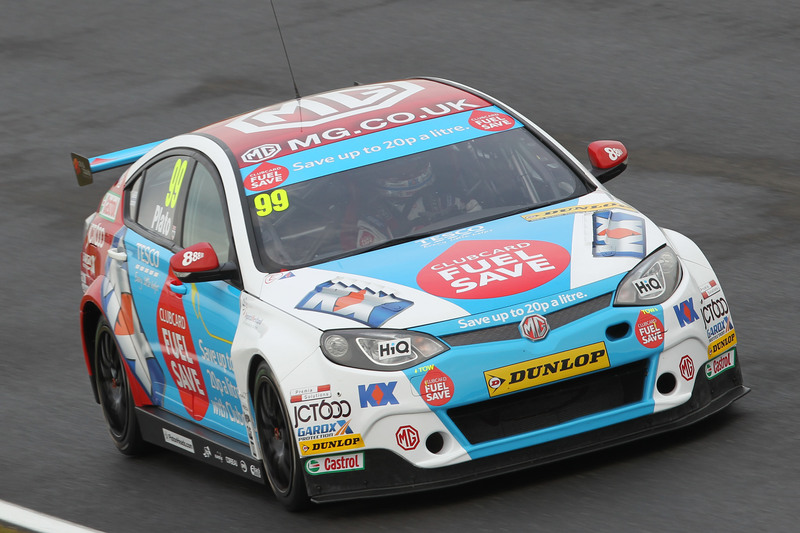 How is it possible for a man who spent much of his time crashing to win the BTCC Independents Championship? It utterly blows my uncomprehending brain-box. It is by this miracle that makes Tommy Rustad a worthy recipient of a place in my memorable drives list. How can anyone forget a man so unlucky yet luckier than any other driver I know? This opening entry in the ‘memorable drives’ series only contains 5 entries so far. There is very good reason for this; we need your views. Who am I to say what the most memorable drives in the championship are? As this little mini-series goes on, I hope to include your suggestions as well as mine. Many races left untouched. Many moments remain. 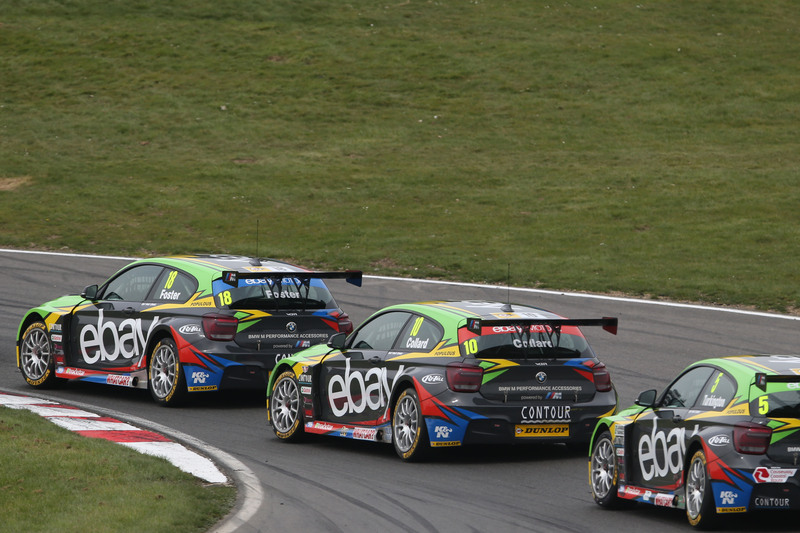 What memorable moments make up the BTCC for you? 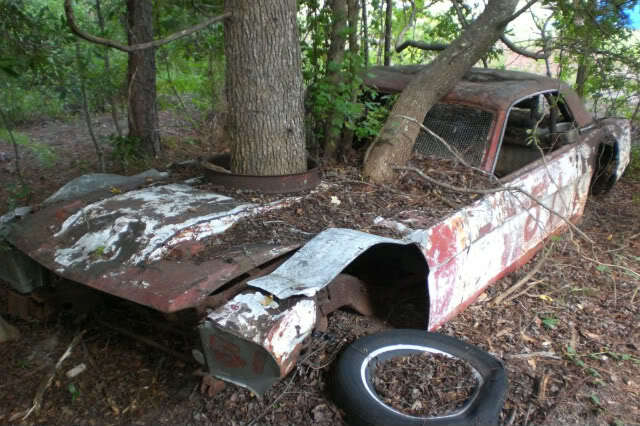 Very few of us are likely to get a bright shiny new car this Christmas. Although some of us might be living in hope… However, in the more realistic gift department, a car-related book might be in order. Possibly this offering from the Top Gear franchise might fit the bill either for you or for someone else you know who’s into motors (if it’s a present for you, tactfully leaving this page open when your nearest and dearest are about to go online might be good for dropping a hint). The subtitle of Top Gear’s “How To Parachute Into A Moving Car” is “Vital survival tips for the modern man.” In spite of this subtitle, the book should give most recipients a chuckle, male or female. And you will get a chuckle. Although there are some bits of good motoring advice sprinkled throughout the text (e.g. how to do a handbrake turn) and some thought-provoking pieces (how to make a car for old people), the majority is a light hearted and slightly cynical look at driving today, especially driving in Britain. If you are (1) after a serious automotive book or (2) easily offended and drive an Audi, then you might want to browse another section of the shelves at your local bookshop. The “how hard can it be?” rating given to each entry provides good material for discussions, and the “how to find your petrol station stance” entry could easily be turned into a sort of game of bingo to keep the kids in the back seat amused when you’re taking a long time at the petrol station refuelling, checking the air pressure in the tyres, etc. Understandably, the book contains numerous references to the TV show itself (well, what do you expect from something published by BBC Books?). If you have seen the episode in question, the commentary will bring back amusing memories. If you haven’t, it will pique your curiosity and make you want to see it (in my case, this was the one about playing rugby with cars). Sometimes, if you haven’t seen the show, the references are a little puzzling and tedious, but on the whole, the book is enjoyable all the same. The tips and “advice” given don’t just confine themselves to car-related topics and wry comments about the three presenters (e.g. “How to dress like James May: Find a charity shop that hasn’t had any new donations since 1976. Buy all their clothes off them.”). You will find other topics related to life in general sprinkled in there, such as “how to feel like a hero when using the microwave oven” and “how to buy trousers”. For the next part of the instructions, you’ll have to read the book yourself. Keep your eyes on the road and your hands upon the wheel…. I’ve been drivin’ all night, my hand’s wet on the wheel. There’s a voice in my head, that drives my heel…..
Let there be light…Sound…Drums…Guitar…Let there be rock! Driving songs. We’ve all got a few that we love to plug into the CD player or USB or MP3 connections; plenty of bass, for that gut kicking thump; the crystal clear highs and the crisp mid range for vocals. What’s that? Bass? Midrange? Treble? What are these words of magic I speak of? All sounds we hear, be it from our tv or MP3 or car stereo, are made up of certain wavelengths, frequencies that vibrate the air around us at certain amounts of times per second. Much like looking at a rainbow and seeing the seven basic wavelengths of light a rainbow shows, what we hear can be broken down into three simple categories and from that, what a good speaker system allows you to hear. To use a very brief science lesson, frequencies are measured in Hertz (http://en.wikipedia.org/wiki/Hertz) and the lower the number, the lower the frequency of sound our ears may pick up. Low end frequencies generate a bass (pronounced base) tone (http://en.wikipedia.org/wiki/Audio_frequency) but also require the most power to generate. Bass sounds come from big drums, the kick in the gut from an explosion and, in home theatre speak, come from a sub woofer. cars, also, can be fitted to carry a sub woofer and work by utilising the air found within a car’s boot to create the sound. Bass notes, in a physical sense, are of a very long wavelength and are, as a result, considered, omnidirectional (or, more specifically, the point at which the ability our ears have to localise sound’s source, ends), in that the source shouldn’t be able to be located. There caveat here, quite simply, is the frequencies that are considered to be sub bass and bass. Moving up through the frequency ladder is mid range; this is generally accepted to be, in easy speak, the range of frequencies the human voice occupies. From the low but powerful tones of Barry White (http://en.wikipedia.org/wiki/Mid-range_speaker) through to the tenor notes of Robbie Williams to the octave stretching notes from Mariah Carey; from the kick drum or rhythm guitar that complements a singer, it’s this range of frequencies that can be either well balanced or overbearing, depending on the listening environment and your own ears. At the top end, literally, is treble (http://en.wikipedia.org/wiki/Treble_%28sound%29). It’s the finish of a tap on a cymbal, the clink of a wine glass in a toast, the flick of a finger on an acoustic guitar….it’s the sound that is also easiest to identify which direction it comes from, as the wavelengths are so tight they make the frequencies more susceptible to being directionally identified. When it comes to car audio systems, especially in modern vehicles, there’s been some subtle yet important changes. In days gone by, you could (and still can, to a point) choose to buy and install a radio head unit that slots into the spot your old and tired AM/FM radio previously occupied. Nowadays these things will have CD playback, a USB port (exactly the same as your computer) and a tiny 3.5 millimetre wide hole with Aux (Auxiliary) marked. Some will come with Bluetooth, the short range radio system so you can wirelessly send music from a smartphone. Some more expensive units will have a small LCD screen built in and a DVD player; the size and heights of these are measured in DIN (double DIN for the taller units) so most will be the standard DIN. 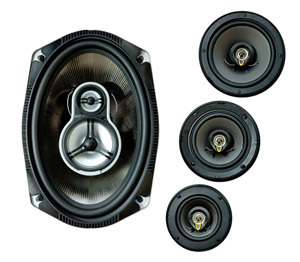 When correctly installed, or from a factory fitted unit, they will then send sound through to the speakers. An aftermarket speaker of decent quality will have a broader speaker diaphragm (the physical speaker material) that will reproduce a range of bass notes and should have two smaller units in the centre. They will generate the mid range and treble notes. In today’s cars, the treble speakers are, generally, to be found in the pillars framing the windscreen, whilst the bass and midrange will be in the doors. Some cars will have the subwoofer unit, as mentioned previously, in the boot or cargo section. When all is married up, balanced for left and right, front and back, you should be able to enjoy your preferred driving songs in full range, crystal clear sound, allowing you to sing along with the best of ’em.